So, yeah, we are remodeling our den. 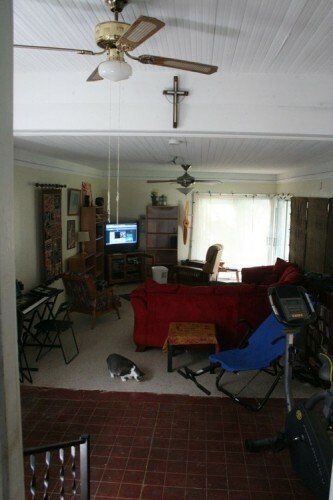 What was going to be just a simple carpet installation has via “project creep” turned into a major renovation. With the impending crawling, pulling up and walking of the little guy, we decided we needed to recarpet the den. 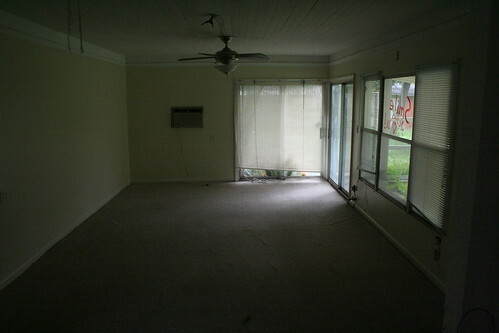 What was there when we moved in was a really cheap, thin, ugly, stained carpet over half of the concrete floor. Not an area conducive to toddlers falling down. There were times when we were playing on the floor when it became uncomfortable for me to simply sit on it. And that was with the carpet, area rug and baby quilt. So: new carpet it is, with a nice thick carpet pad. Kelly decided that he would skim coat the janky walls and paint before the carpet was installed (we didn’t want to attempt to DIY a carpet install, and Home Depot had a good deal on installation…). However, when I was still with the baby in Michigan at my parents’ house, I get a text telling me that a friend of his was trying to convince him to insulate the walls and what did I think? Well, since this room is not on the central AC or heat, it has always been HOT in the summer and COLD in the winter. If we were going to make this room’s floor a nice place for the baby to play, we might as well make the temperature good too. So I gave Kelly the go-ahead. 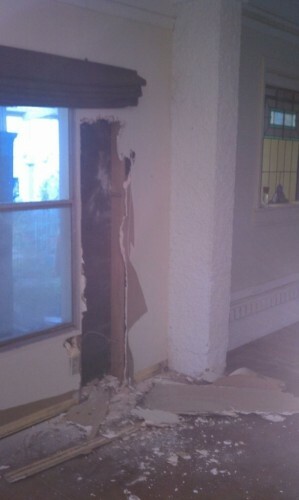 The next thing I knew I had gotten a text message with a picture of a big hole in the wall. And it just got worse from there. But, like I said in the previous post, it always has to get worse before it gets better. This entry was posted on Friday, August 10th, 2012 at 9:02 amand is filed under . You can follow any responses to this entry through the RSS 2.0 feed. You can leave a response, or trackback from your own site.